Hi everyone! Today I have another tutorial ﻿that I am really excited about because it's not only a super dramatic look, but also because I got to use my good friend Hannah as a model again. If you don't remember her she is my blonde-haired, blue-eyed friend from this tutorial and also this bb cream review. The inspiration for this look came from the recent Disney Tron: Legacy movie which I saw a couple weeks ago. As soon as I saw the character design for the Sirens (programs that dress those entering the games) I was smitten! The contrast of eyes, lashes, skin, and hair was really thrilling to watch on screen and I wanted to recreate the look in a video. Here are some of the reference images I used for recreating the look of Gem, the lead Siren played by Beau Garrett. 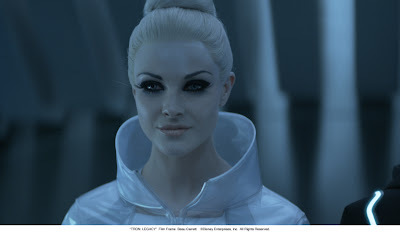 She's stunning in the movie and reminds me a lot of model Jessica Stam! You can see in this image how highly arched her black eyebrows were drawn in. She even did her own hair! She added a lot of baby powder to her hair to make it lighter for this look and I think the top knot looks really cool. The lady has serious hair skills. Sharp, clean lines on the lids and crazy eyebrows. I love this angle. I think it makes Hannah look robotic and glowy somehow. LOL! Like a real program should! i lovee this look, it's so daring! LOL at first I thought the picture was of you instead of Hannah and was like WHOA. Awesome job -- looks just like the girl in the movie! Just some thoughts from a total amateur: maybe if you had used shorter and spikier bottom lashes it would have preserved more of a cat-eye effect like in the inspiration? Because the top lashes would have extended out further than the bottom? Maybe I will try this adjustment if I play with this look! i loved the look jen! and your friend has amazing grey/blue eyes- they almost twinkle! Ahhh!! I loved Tron Legacy so much!! Thank you for posting this!! That is sooo cool! Hannah rocks this character! Great tutorial Jen!! It's a very BOLD look tho, gonna keep it in mind for this year's Halloween! can u let hannah do the hair top tutorial? it looks great! n u managed it superbly well..loved it..
i love the look but i think the eyebrows weren't concealed properly? just wondering where your earrings are from. they are so cute! thanks for the tutorial. i loved gem's character in tron, although she was evil in the end! Question: What brush or brushes do you usually use to apply your MAC Fluidline? I'm trying to find a good one. Thanks, Jen! your makeup looks great! could you let me know what makeup you used? I love the look. Question though: I noticed that this happens to me when I use foundation that's lighter than my normal skin tone as well. Hannah's eyes look really red in contrast with her skin and the dark eye makeup, especially in the pictures. Is there anyway to prevent that? This looks like you had fun! Hannah looks so beautiful! She is always beautiful but here as a siren she looks va va BOOM! Oh wow that's stunning. 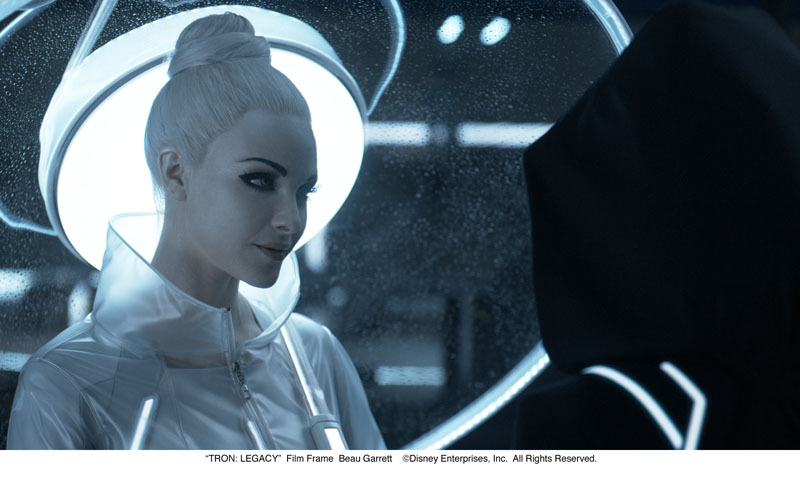 The whole time I was watching Tron I was thinking of ways I can make the white girl into a Halloween costume next year. Thanks for the makeup help! that's a great tutorial, she looks so different with the make-up on ö_ö just like gem! i was wondering if you have ever modeled before because i was reading a loulou megazine, it was issue november 2010 and i came across a west edmonton mall promotion in page # 130 and the model looked very very similer to you. i was wondering if that model was actually you. 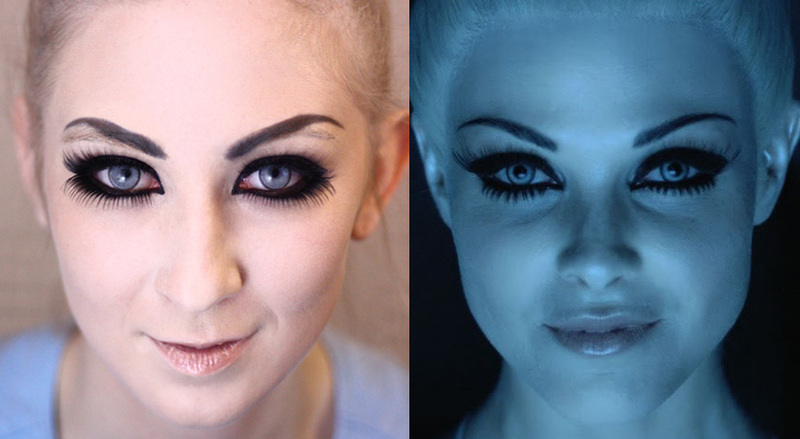 I saw Tron a while ago and definitely fell in love with the Sirens' makeup, just like you. Hannah's eye makeup looks great! I love Gem's look. She is stunning.